Dubai Properties’ flagship project 1/JBR, which is taking shape on one of the final plots of land in Jumeirah Beach Residence (JBR) district, is on track for a timely handover in the fourth quarter of 2019. The premium development is located on Al Mamsha Street at the entrance of Jumeirah Beach Residence, nestled between the five-star properties of Le Royal Meridien Beach Resort & Spa and The Ritz-Carlton, Dubai. Bearing the distinction of being the only residential development in the district with private beachfront access, 1/JBR promises to set new benchmarks for Dubai’s prime residential sector through offering a luxury lifestyle experience in an aesthetically understated ambience, said the top developer. Poised to join the ranks of the most coveted, top-of-mind beachfront properties in Dubai, 1/JBR will boast breath-taking panoramic views of the Arabian Gulf, with each beachfront-facing apartment featuring floor-to-ceiling windows. Conveniently located at the entrance of JBR, the development will be the only residential property in the area with direct beach access, and its own dedicated roundabout for easy access to and from the community, it stated. On the project, Marwan Al Kindi, the executive director of sales and sales operations at Dubai Properties, said: "We are committed to the highest standards of excellence in every aspect of the residential and commercial development process." "Our contribution to the UAE’s beachfront real estate sector is exemplified in the execution of 1/JBR that is already setting the benchmark for a new class of understated luxury. Dubai Properties is renowned for successfully combining visionary architecture and design with state-of-the-art construction and functionality, maintained through each phase of the project," he noted. With the core walls cast as far up as the 14th floor, work is rapidly progressing at the speed of one floor per week, stated Al Kindi. "Once completed, 1/JBR will rise 46 floors above the Arabian Gulf and feature a total of 163 units, including two-, three-, and four-bedroom apartments, as well as five-bedroom penthouses with minimalist interiors, subtly incorporating luxury elements," he noted. "In total, the high-rise development will comprise a gross floor area (GFA) of over 45,000 sq m, with the built-upon area (BUA) spanning 74,000 sq m," he added. Meticulously designed to offer the utmost privacy, apartments on the top 15 floors will feature private lobbies, with semi-private lobbies for the first 30 floors. In addition, all apartments on the 31stfloor and above will have private elevators, operated using personalised digital key cards. 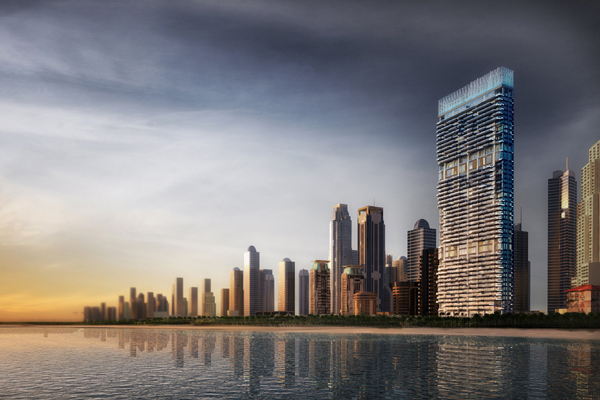 Dubai Properties has appointed Edge as the design architect and lead consultant for 1/JBR. In collaboration with WSP, one of the world’s leading engineering professional services companies, the award-winning Dubai-based architecture firm is working closely with the master developer’s in-house project management team to ensure that all phases of the construction progress on schedule, said Al Kindi. The main contractor for 1/JBR is Dubai Contracting Company (DCC), one of the key players in the field of building construction in the UAE. Martin Baerschmidt, the founding partner and managing director at Edge, said: "We designed 1/JBR keeping in mind two primary goals – waterfront views and spatial clarity. The minimalist aesthetic permeates every aspect of the building and its interior design." "As a result, each space conveys a sense of serenity that is not commonly found in residential buildings. Inspired by Emirates Towers, one of Dubai’s most iconic mixed-use developments, 1/JBR, upon completion, will redefine Dubai’s skyline as it becomes one of the most slender towers in this city of skyscrapers," remarked Baerschmidt. To ensure residents enjoy easy access to their homes with minimal traffic snarls, Dubai Properties has worked closely with Dubai Municipality and Roads and Transport Authority (RTA) to plan a dedicated roundabout, said Al Kindi.